Designed for use in NFPA 70 defined Class I-Group D and Class II-Groups E, F, & G atmospheres. Hazardous locations equipment for area where the presence of flammable gases, vapors, or finely pulverized dust in the atmosphere is sufficient to create a threat of explosion or fire. Equipped with ULPA filtration: 99.999% efficiency on 0.12 micron. 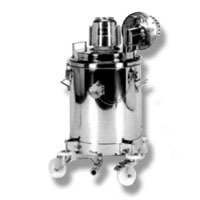 Also includes autoclavable recovery tank and standard accessories made entirely of stainless steel. Included is an EDPM suction hose.